I really loved the book. Matilda s soo sweet. I will definitely reccomend this book and I think it deserves five stars! Matilda is just such a fun loving sweet girl. My suggestion would be to make a secend book. I really like all your books, keep writing!!!!!! I loved matilda because she is super smart!I hated the evil Trunchbull (very strong)I hope read and like this book. It was a great story. 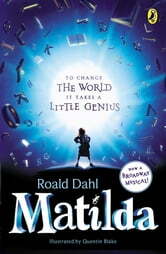 I love Matilda.Trunchbull was very mean. Matilda is very clever. I love Matilda.